This unique Supertunia® features bicolor purple flowers with mint green edges on beautifully mounded to trailing plants. 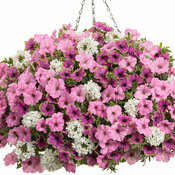 It mixes well with many other colors in combination containers, hanging baskets, and your sunny landscape. 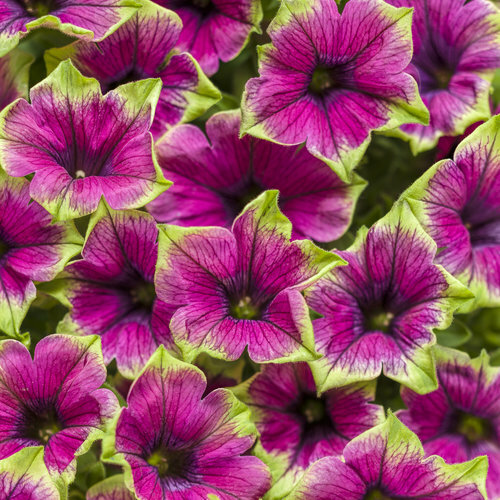 Picasso in Purple™ is a strong grower and blooms all season without deadheading. 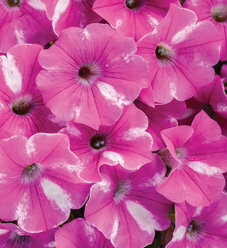 Great in landscapes where it works best at the front of garden beds. 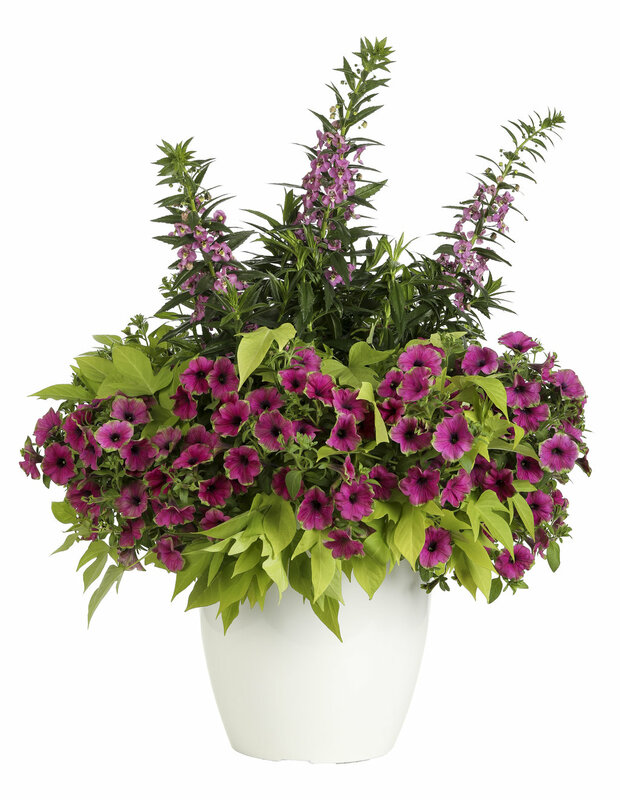 It is also an excellent container plant where it functions as both a filler and a spiller. 1. 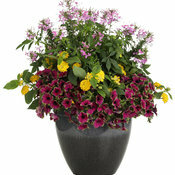 When you buy them in the spring, buy a slow release fertilizer to top dress the basket or container. 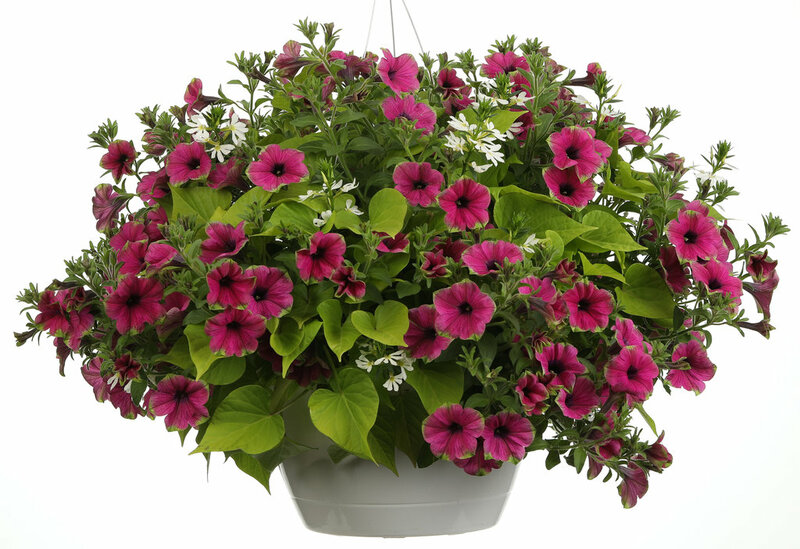 If you plant your own basket, incorporate some of the slow release fertilizer in the soil as you plant. Follow the package directions. 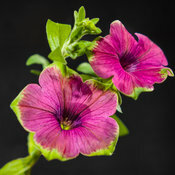 While not necessary as they are well branched plants to begin with, I will usually give them a very slight trim back while I am transplanting them to encourage even more branching and ultimately more flowers. 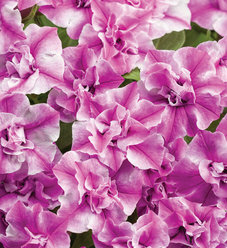 If you are transplanting stretched plants cut them back by as much as a third to help improve the habit. some of the longer branches just enough to bring the plant back in line with the bottom of the pot or basket. Don't remove too much. At the maximum, cut back 20% of the branches or 1 in five shoots. You can also just give it a general light trim. Your plant will be out of flower for a few days, but will come back stronger than ever. 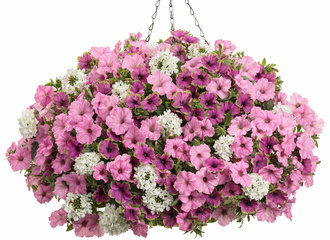 By now with July's heat you should be watering at least every other day and begin to fertilize every other watering. I know it sounds like a lot, but if you want a plant to grow like an elephant, you need to feed it like an elephant! 5. August is, hot, humid, and sometimes with monsoons. Keep up the water and fertilizing, and again, if the plant starts to look straggly remove a few more branches but never more than 20%. Otherwise you can give it a general trim as before. I know it sounds like a lot of work, but it really is a labor of love. 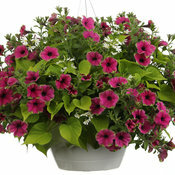 I fertilize my baskets and my garden every time I water, and I water daily from mid July through August. I recently invested in the WaterWise irrigation system and it really works! 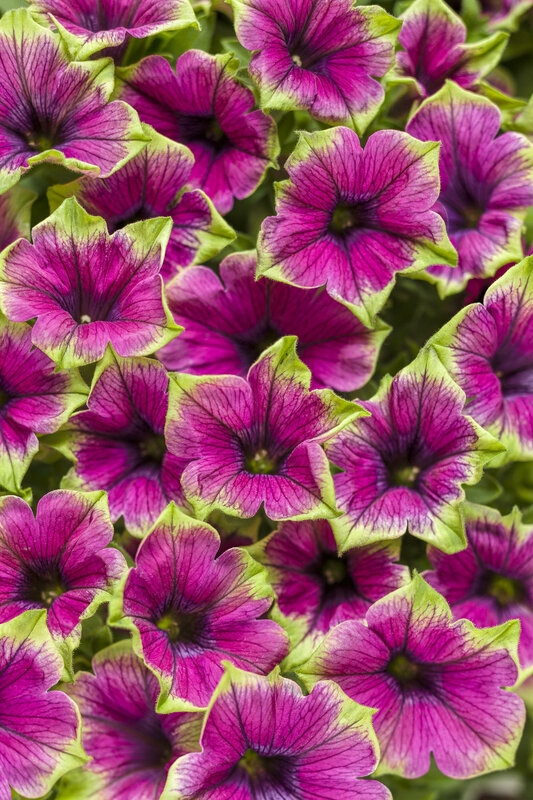 You will find that your Supertunia, along with all the rest of your plants will keep looking fantastic through September and perhaps with the luck of a gardener and a late frost maybe even into October. 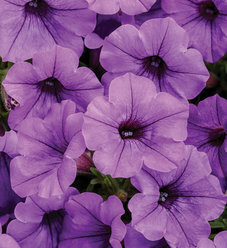 I loved this plant when I had it in 2016.It grew beyond my expectations in an East location. I tried at 3 major nurseries here in Quebec last year and it was not available. So sad. Was pretty. But, the original Pretty Much Picaso is still my favorite! 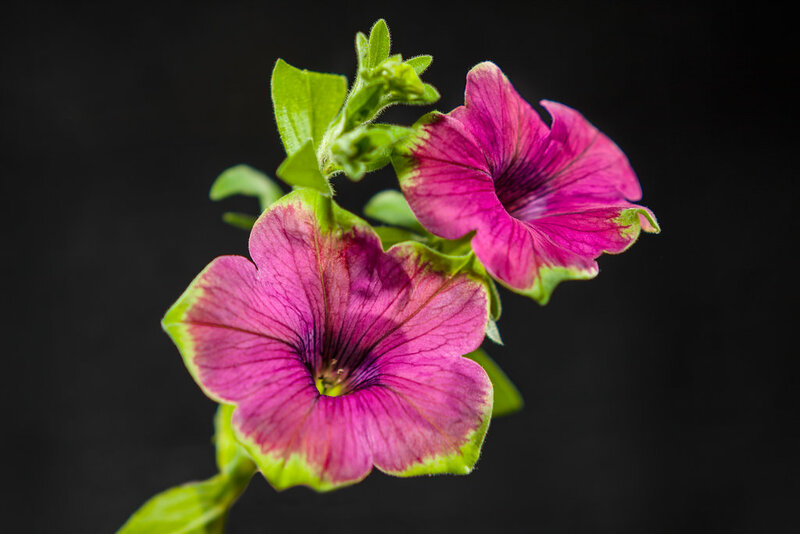 Best petunia I have ever grown! 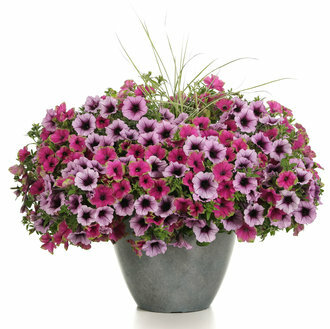 No dead-heading necessary. The old blooms simply fade instead of shriveling up, and the new blooms pile up on top of them, creating a wonderful mound and cascade. 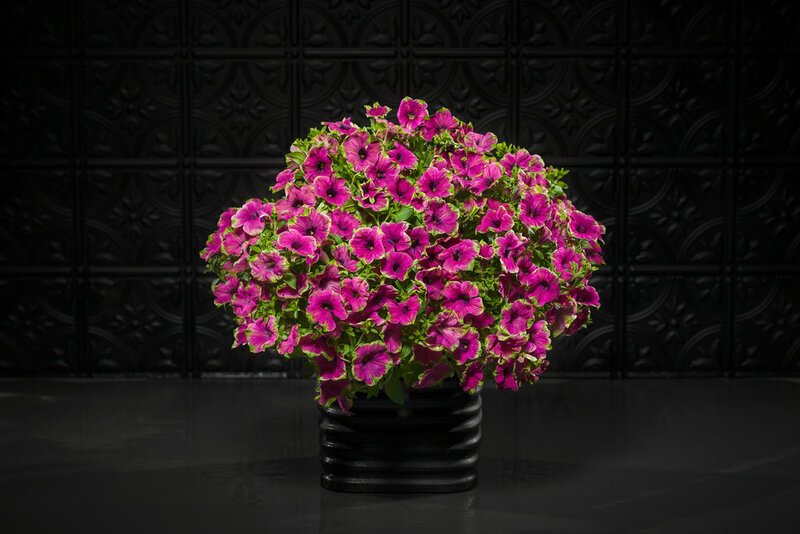 striking when combined with lime green coloured ipomoea in a black pot.